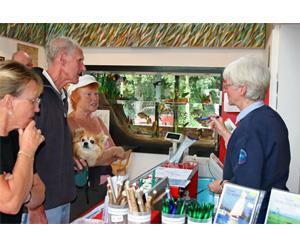 Hoveton Broads Information Centre01603 756097work Information CentreInformation centre situated on the River Bure. Information and displays about Hoveton and the Broads. Enquiry service.Bookings for accommodation and Broads Authority boat trips. Books, maps, guides, postcards & gifts to buy. Information centre situated on the River Bure. Information and displays about Hoveton and the Broads. Enquiry service.Bookings for accommodation and Broads Authority boat trips. Books, maps, guides, postcards & gifts to buy. Hoveton and Wroxham lie north and south of Wroxham Bridge, which takes the A1151 over the River Bure. Station Road is off the A1151 in the centre of Hoveton.